This is a head CT from a person who has recently begun to show symptoms of a severe left MCA stroke. 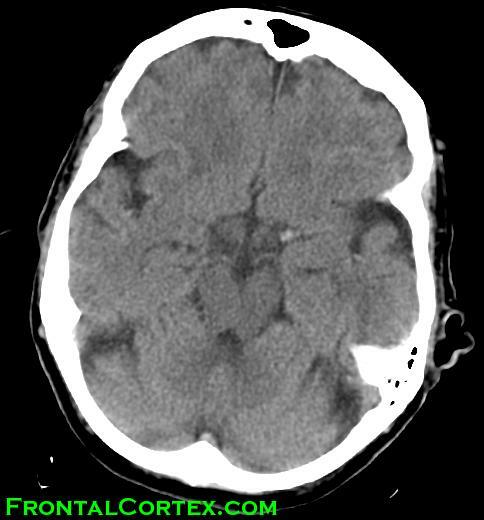 As CT does not show tissue changes in the first several hours, the brain parenchyma appears normal even though it is infarcting. What can be seen sometimes, and is seen in this image, is an unusually radiodense appearance of the left middle cerebral artery. The clotted blood in this artery gives it a brighter white appearance than the right MCA. A normal head CT for comparison. The left MCA is visible, but is less dense (it is a darker shade of grey). The green area in this image highlights the middle cerebral artery.